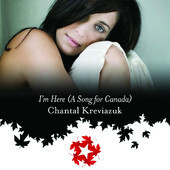 Chantal Kreviazuk released a new song today I'm Here (A Song for Canada). Part of the proceeds from the song will go to the National Music Centre (which is going to be in Calgary). The finished song was co-written by the dude who wrote I Believe from the 2010 Olympics. I shouldn't have to tell you any more about the song based on that alone. Chantal's hubby, Raine Maida, was involved in the song, but he doesn't sing...which is a giant disappointment. I mean...I DO like the finished version better, but I think the kid got ripped off. Oh well.